I realize this post is old, but there's no marked solution and I just wanted to throw in how I resolved this. The first Error 5: Access Denied error was resolved by giving permissions to the output directory to the NETWORK SERVICE account. The second Started and then stopped error seems to be a generic message when something faulted the service. Check the Event Viewer (specifically the 'Windows Logs > Application') for the real error message. In my case, it was a bad service configuration setting in app.config. Computer -> Manage -> Service -> [your service] properties. Then the the tab with the account information. Play with those settings, like run the service with administrator account or so. EDIT: What also can be the problem is that, most services are run as LOCAL SERVICE or LOCAL SYSTEM accounts. Now when you run C:/my-admin-dir/service.exe with those accounts but they are not allowed to execute anything in that directory, you will get error 5. So locate the executable of the service, RMB the directory -> Properties -> Security and make sure that the account the service is run with, is in the list of users that are alloewd to have full control over the directory. Highlight SYSTEM user, and click ALLOW check-box next to "Full control"
I also got the same error , It resolved by Right click on Service > Properties >Log On > log on as : Local System Account. Make sure the Path to executable points to an actual executable (Right click service -> Properties -> General tab). Via powershell (and sc.exe) you can install a service without pointing to an executable... ahem. 5. select "local system account"
now you can try to start the service. In my case following was not checked. This error happens when there is a error in your OnStart method. You cannot open a host directly in OnStart method because it will not actually open when it is called, but instead it will wait for the control. So you have to use a thread. This is my example. For me - the folder from which the service was to run, and the files in it, were encrypted using the Windows "Encrypt" option. Removing that and - voila! I had windows service hosted using OWIN and TopShelf. I was not able to start it. Same error - "Access denied 5"
I ended up giving all the perms to my bin/Debug. The issue was still not resolved. So I had a look in the event logs and it turned out that the Microsoft.Owin.Host.HttpListener was not included in the class library containing the OWIN start up class. So, please make sure you check the event log to identify the root cause before beginning to get into perms, etc. Your code may be running in the security context of a user that is not allowed to start a service. Since you are using WCF, I am guessing that you are in the context of NETWORK SERVICE. 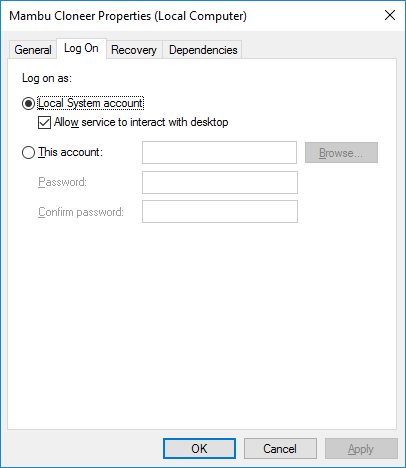 Use LocalSystem Account instead of LocalService Account in Service Installer. Properties of Service Process Installer -> Set Account to LocalSystem. Right click on the service in service.msc and select property. Navigate to C:\Users\Me\Desktop\project\Tor and right click on Tor. In my case, I had to add 'Authenticated Users' in the list of 'Group or User Names' in the folder where the executable was installed. One of the causes for this error is insufficient permissions (Authenticated Users) in your local folder. To give permission for 'Authenticated Users' Open the security tab in properties of your folder, Edit and Add 'Authenticated Users' group and Apply changes. Once this was done I was able to run services even through network service account (before this I was only able to run with Local system account). Have a look at Process Utilities > Process monitor from http://www.sysinternals.com. This is tool that allows you monitor what a process does. If you monitor this service process, you should see an access denied somewhere, and on what resource the access denied is given. For the error 5, i did the opposite to the solution above. "The first Error 5: Access Denied error was resolved by giving permissions to the output directory to the NETWORK SERVICE account." If you are getting this error on a server machine try give access to the folder you got the real windows service exe. You should go to the security tab and select the Local Service as user and should give full access. You should do the same for the exe too. I have monitored sppsvc.exe using process monitor and found out that it was trying to write to the HKEY_LOCAL_MACHINE\SYSTEM\WPA key. After giving permissions to NETWORK SERVICE on this key, I was able to start the service and Windows suddenly recognized that it was activated again. After banging my had against my desk for a few hours trying to figure this out, somehow my "Main" method got emptied of it's code! In may case system run out of free space on local disk. I had this issue today on a service that I was developing, and none of the other suggestions on this question worked. In my case, I had a missing .dll dependency in the folder where the service ran from. When I added the dependencies, the issue went away. In my case I kept the project on desktop and to access the desktop we need to add permission to the folder so I simply moved my project folder to C:\ directory now its working like a charm. I don't know if my answer would make sense to many, but I too faced the same issue and the solution was outrageously simple. All I had to do was to open the program which I used to run the code as an administrator. (right-click --> Run as Administrator). I was getting this error because I misread the accepted answer from here: Create Windows service from executable. For <path_to_service_executable>, I was using the path of the executable's folder, e.g. C:\Folder. It needs to be the path of the executable, e.g. C:\Folder\Executable.exe. Hopefully this helps someone who made the same silly mistake as I did. I had this issue on a service that I was deploying, and none of the other suggestions on this question worked. In my case, it was because my .config (xml) wasn't valid. I made a copy and paste error when copying from qualif to prod. Click the Start menu and choose Run or use the keyboard shortcut of Win+R. In the dialog box, type lusrmgr.msc. When this application opens, click Users in the left-hand panel and then right click Administrator in the right-hand panel. Click Properties in the menu. Another dialog will appear. From there click Find Now on the right. A list of search results will appear at the bottom of the dialog. Select Network Services from this list and click OK on each of the open dialogs. Not the answer you're looking for? Browse other questions tagged c# .net wcf windows-services or ask your own question. Can I host a WCF Service in a windows service?